Third version of Yokai Watch 2 due out in December. 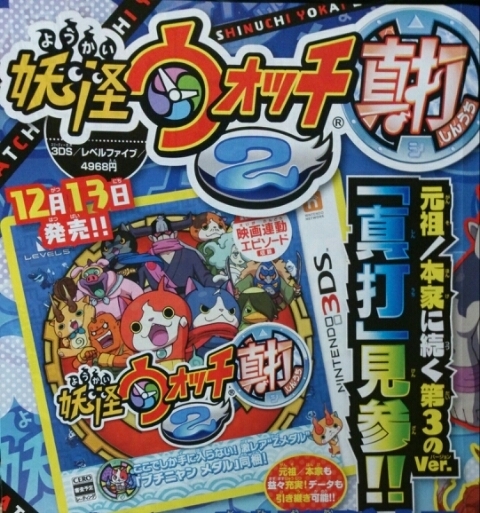 Yokai Watch 2 launched in Ganso and Honke versions in Japan this past July, but a third version of the game is coming in December, this month’s issue of CoroCoro Comic reveals. Yokai Watch 2: Shinuchi (Headliner) will launch on December 13 in Japan for 4,968 yen. The packaged version includes a Buchinyan medal. And Jibakoma will appear in the game via a 3DS QR code. The downloadable version won’t feature the medal, but in its stead will include a Masked Nyan. If you already have Ganso or Honke, Shinuchi will be compatible with its save data.